Starting with the New Year, we are changing the format of The Cruise Examiner a little bit in order to bring you the latest news (not the news that comes from press releases but the news that circulates without always appearing in the usual places). 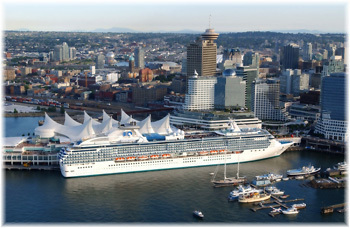 Each week we will also bring you a special topic, this week's being cruise ships at the Vancouver Olympics. The interesting news this week is that Cunard's Queen Victoria, on the final leg of her January Transatlantic voyage from Southampton, has arrived at New York early (today, Monday, 11th January). Her original expected time of arrival had been about 6 pm but she is arriving at noon instead. Those on board are being treated to an introduction to New York by Ted Scull, writer and author of "The 100 Best Cruise Vacations," who is giving a running commentary from the bridge. Passenger count for the Transatlantic crossing was reported to be 1,400 Brits, 220 Germans and only 97 Americans, plus others. The Queen Victoria left Southampton a week ago today (Monday, 4th January) and sets off from New York tomorrow on her 2010 world cruise. She is due back at Southampton on 22nd April. On one of her crossings, San Francisco to Sydney on 26th January, she will be followed six days later by P&O's Arcadia, the ship that had originally been intended to be completed as the Queen Victoria before there was a change of plan and the present ship was completed to a slightly longer design. This year's contracted New York-Hamilton Front Street ship is due to start her season of 24 Bermuda cruises on 25th April. But an interesting story has been circulating in the meantime about her new Retreat area. In an effort to pack a few more passengers on board, last spring Holland America built cabins into the area that used to house her aft swimming pool. They then replaced the pool with a new area called The Retreat, in which passengers sit in deck chairs with a few inches of water around their feet. Well, the Veendam's Retreat has apparently been leaking onto the outer decks and has created some problems. Not only that, some more cabins have been tacked on to the ship's back end and she now has a ducktail and balconies that overhang her aft dining room, something that has quite ruined her appearance for some. Holland America's Rotterdam has been given a similar treatment, but with no ducktail, and four more of their ships are expected to receive similar modifications, including cabins that will open up directly onto the open promenade deck, between now and 2013. 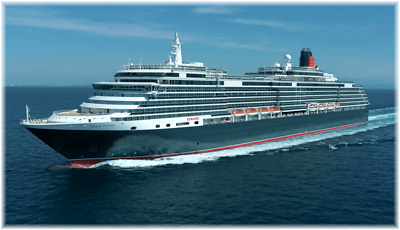 Saturday saw Cunard's new Queen Elizabeth transferred from her building dock to her fitting out dock in Monfalcone. From the port bow quarter she is already painted in Cunard colours but the rest of the ship is still largely in primer as her new colours are being applied. The new Cunard ocean liner was floated out last Tuesday (5th January), when the honourary godmother for the occasion was Dennie Farmer, whose late husband served as Chief Engineer in both the original Queen Elizabeth and the Queen Elizabeth 2. The new Queen Elizabeth, whose master, Capt Chris Well, was a former master of Queen Mary 2, sets off from Southampton on her maiden voyage on 12th October this year and her maiden world cruise will leave Southampton on 5th January 2011. With the Winter Olympics in Vancouver next month, several cruise ships will be arriving in a very off-season Vancouver, whose usual cruise season lasts from about May to October. Holland America's Statendam is now on her way up the west coast and is expected at Vancouver's Ballantyne Pier on Tuesday or Wednesday, while the Mona Lisa, built in 1967 as Swedish America Line's fabulous Kungsholm, passed through the Panama Canal yesterday, also bound for Vancouver. With the Statendam due tomorrow as the first arrival, two more Carnival Corporation & PLC ships will also be coming to Vancouver. The Carnival Elation is due on 28th January and the Oosterdam on the 31st. These three will be chartered to the Royal Canadian Mounted Police (RCMP), who intend to use them to house 5,000 security officers. Separately, the Norwegian Star is expected on 10th February to be used as a hotel ship by Newwest Travel & Cruises of Edmonton. Last year, Cruise Connections Charter Management launched a law suit for unspecified damages against the RCMP in the District of Columbia. This case was launched after the RCMP reneged on an original contract with Cruise Connections of Victoria to supply two ships from Carnival and one from Holland America, as Cruise Connections claimed it had lost a $13 million profit. 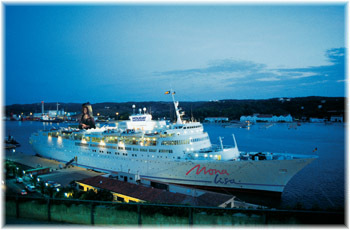 Originally, the deal was to have been for two Royal Caribbean ships, but this was later changed to three. The RCMP was accused of fudging the numbers in order to break that contract so that it could take advantage of the world recession to obtain lower prices. Things did go the RCMP's way in June 2009 when the DC court threw the law suit out on the grounds that it did not have jurisdiction to hear the case. But where the RCMP had wanted to get a better price, in April it had ended up settling direct with Carnival and Holland America but for a higher price. What they got was a new contract under which they are now paying $76 million for three ships instead of $55.4 million. Where are the savings, people have been asking, as they contemplate a bill for an additional $21.4 million, but the RCMP have said that they cannot discuss the subject. Meanwhile,Cruise Connections also launched a $75 million lawsuit against Newwest Travel, claiming that it had breached an exclusive agreement whereby they had originally agreed to bid jointly to the RCMP, something that Newwest withdrew from after its financial backer got cold feet. Meanwhile, Cruise Connections won the RCMP bid and Newwest Travel arranged a separate charter to use the Norwegian Star as a hotel ship. Where that case has gone we don't know. However, recently, Newwest has had to reduce its expected prices on the Norwegian Star after bookings did not come in at the originally established tariff. The starting prices has apparently now come down somewhat from the original idea of $700 per room per night for a range of 2- to 20-night packages, including meals, airport tranfers and Olympic transfers. The Norwegian Star will remain at her berth in North Vancouver for 20 days, as well as offering positioning cruises from Los Angeles via Victoria to Vancouver on 6th February, and back from Vancouver via San Francisco to Los Angeles on 2nd March, each of four days. Her 1,150 rooms will add about 10% to Vancouver's hotel capacity for the duration of the games. The Mona Lisa, meanwhile, will be berthed up the coast a bit at Squamish, BC, which is on the road from Vancover to the ski hills of Whistler. She will be based there from 26th January to 23rd March to house 1,000 Olympic workers, with another 1,000 ashore in Squamish and 4,000 at Whistler. Such hotel ship charters seem to be a complicated and risky business, for everyone that is except the cruise lines, for whom it seems most lucrative.